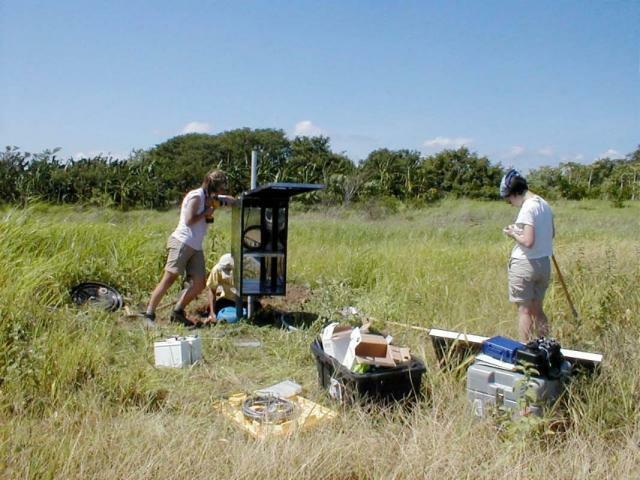 Installing a PASSCAL broadband seismograph in Costa Rica. The seismometer is fixed to the base of a cement-lined hole beneath the large utility box left of center. During its three-year deployment, the instrument recorded earthquakes associated with the Central America subduction zone. Researchers visited the site at regular intervals to check the seismometer battery pack and to download earthquake data captured since the last visit. Image courtesy of Geoff Abers.